Raman scattering of photons by molecules was discovered by Chandrasekhara Venkata Raman, an Indian physicist, in 1923. Raman received the Nobel prize in Physics in 1930 for his contribution. The photon comes out of this interaction with the same energy. This is called Rayleigh scattering and is the most common outcome. We see this every morning when we look in the mirror. When the photon does not come out at all, then we call it absorption. The photon comes out with less energy. This is called Raman scattering, and the shift in wavelength towards the red is called the Stokes shift. When this happens, the photon delivers energy to molecular vibrations or to collective vibrations of a solid, called phonons. We never see this. The effect is very weak, and the Stokes shift is so tiny, that the sensors in our eyes are incapable to follow and distinguish the original light from the scattered. The photon comes out with more energy. This is also called Raman scattering, and the shift is now towards the blue, being called anti-Stokes shift. Here the photon receives energy from vibrations and this effect is also very weak, unseen by our eyes. For a long time, the Raman effect was useless spectroscopically or technically, due to its intrinsical weakness. This changed drastically with the advent of coherent laser light. The Raman effect continues very weakly, but now the intensity of laser light makes up for this weakness. Lots of photons strike the sample and consequently, more Raman scattered photons come out. Additionally, the near monochromaticity of laser light is now an ideal tool for spectroscopy. You might ask now: What do I get measuring the Stokes shift? Well, you get the energy of vibrations of molecules or solids. Since even the simplest molecules can have several types of vibrations, you get a “fingerprint” in the Raman spectrum, which is unique for each molecule. 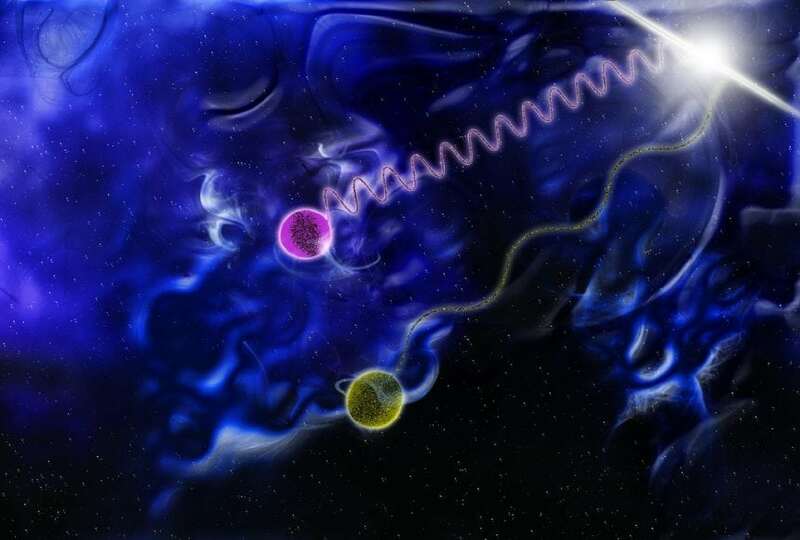 Before we proceed, let us make it clear that photons are quanta of the electromagnetic field, that the electron cloud of atoms and molecules is a quantum-mechanical entity and that molecular vibrations and phonons are quantized. You must bear this in mind when we simplify the quantum description of the Raman effect. So far so good. But thirty-four years ago, a team (Fleischmann, Hendra, and McQuillan) from the Chemistry Department of the University of Southampton discovered the so-called surface-enhanced Raman scattering, known by its acronym SERS. This enhancement is so huge, that scattering of photons from single isolated molecules is possible and detectable. This is great news. People from Biology, Medicine, and Forensics are excited with the possibilities provided by SERS. There are basically two theoretical views to explain this extraordinary enhancement provided by SERS. First, and independently of the theory, a nanostructure must be provided. And the nanostructure is required to be of a special kind: it must foster surface plasmons. Surface plasmons are described as collective oscillations of electrons. To oscillate, electrons must be free to move. Now, one theory says that the interaction of the incoming photon with the electron clouds of the nanostructure generates enormous electromagnetic fields at certain locations of the nanostructure, and if a molecule sits at this location, then the Raman yield is enhanced by orders of magnitude. This is the dominant theory. The other theory does not dispute the strong electromagnetic fields but says that the molecule, which sits at the location needs somehow to be attached via charge-transfer to the nanostructure. 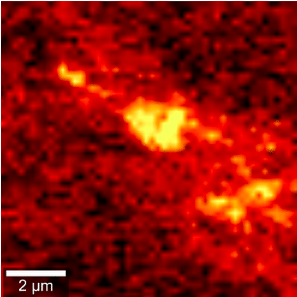 Independently of this dispute, SERS works nicely experimentally: one detects single molecules, no doubt about its identity and no need to put a tag on it. Since the beginning of SERS, silver and gold nanostructures were the obvious choice of the experimentalists. This is because they are metals and their electrons are free to oscillate and act as plasmons. Silver and especially gold are relatively inert, and their nanostructures are relatively stable, which is good if you want to develop and sell substrates for SERS. Secondly, gold and silver plasmons naturally absorb visible light, where lasers are readily available. In certain cases, there is even a match of the plasmon frequency with the laser frequency. This is then called resonant SERS, or in short, SERRS. More enhancement is possible with SERRS. But science never stops. Think perhaps of some nanoparticle which you want to guide and attract to a tumor. Suppose you want to detect the tumor via SERS. Then you have got a problem with silver and gold nanoparticles, which are toxic. Remember: silver nanoparticles are used to kill bacteria in socks and wearables. Then you would need some other nanoparticle system for this task. This and other types of needs push the SERS field forward. The research on bismuth nanoparticles, which appeared in the November issue of the Journal of Nanoparticle Research (J Nanopart Res (2017) 19:362), showed that the enhancement of Raman scattering provided by these nanoparticles is of the order of 100 billion. This figure shows the locations of Proline molecules in yellow. These molecules were detected by SERS using bismuth nanoparticles. The whole image of 10 x 10 µm2 was constructed by Raman scattering. Each pixel contains a whole Raman spectrum. Yellow means: here is the location of a Proline molecule. These findings are described in the article entitled Surface-enhanced Raman scattering using bismuth nanoparticles: a study with amino acids, published in the Journal of Nanoparticle Research. This work was led by Wido H. Schreiner from Universidade Federal do Paraná.